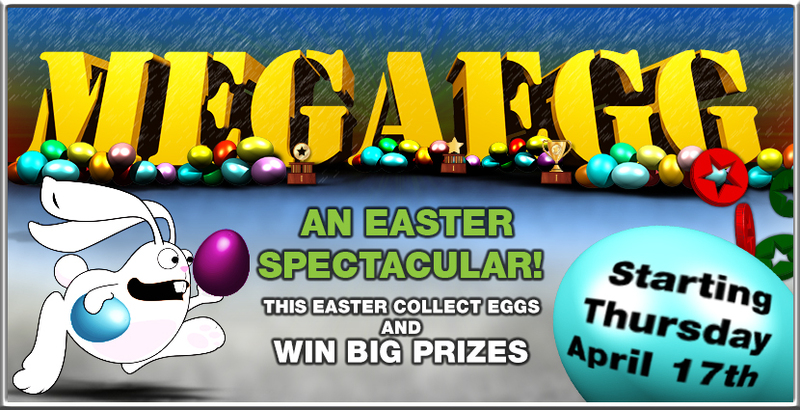 MEGAEGG is back, and the CC Bunny will be kicking off the Easter hijinks! Can you square the circle? Plus other big prizes for the Tournament of Cuddles! 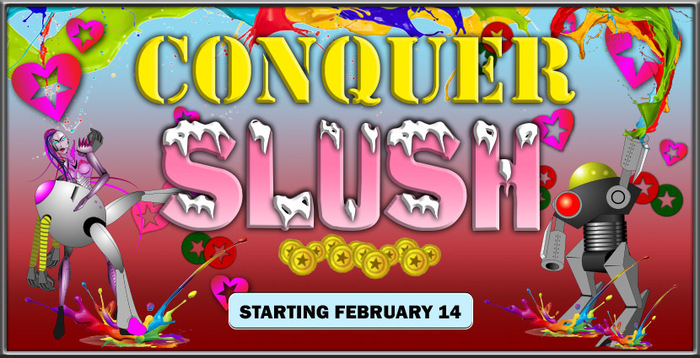 Hey clubbers, it's Valentine's Day - time to get all slushy. 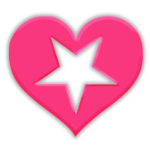 Collect enough Hearts to enter the Tournament of Cuddles and compete for big prizes including Credits, Trophies and a Red Star! Find yourself in some inexplicable scenarios. On January 1, Conquer Club turns 13.
Who is ready to Royale!? Collect CC13 cakes by joining and winning a rolling series of rumbling Battle Royales. Collect 35 cakes to join the Monster Royale! First 24 to join Monster Royale compete for a and other prizes! 7 days of merry, Christmas Club cheer! Start any game from Dec 22 - Dec 28 or win any of those games by year's end for a chance to score Stockings and Gifts. Chances of all item drops increase with number of players. Speed and assassin games have a lower chance of winning. Bot games have a grinch-like chance of winning. Your best chance, naturally, will come from the Christmas Map. Stuff your Stockings with Gifts to score points: To score a point for a Gift you must have a corresponding color of Stocking to stuff it in. Each Stocking only fits 5 Gifts, so for each 5 Gifts you will need to have another Stocking of that color for them to count. Ties will be broken by the total count of gifts, then stockings, then the timing of your first stocking - the sooner the merrier. Merry Christmas, Happy Holidays and Successful Conquering to all! December 21, 2018 is the 50th anniversary of Apollo 8, which was the first manned spacecraft to orbit the moon. This was the first of an unfortunate series of events that led to the Lunar War. 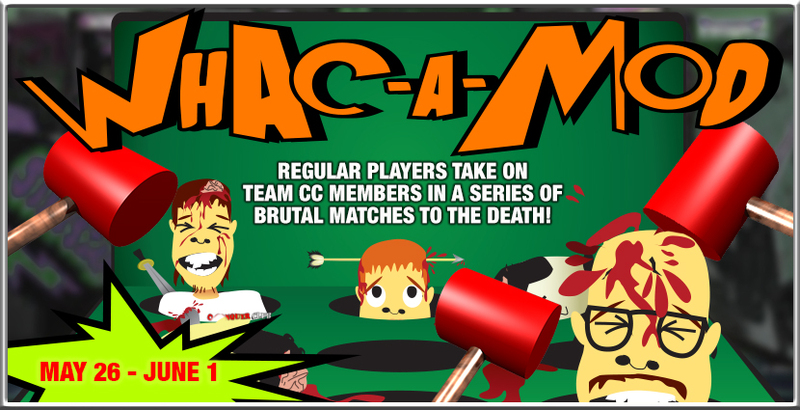 Take on Team CC by joining Games from the Whac-A-Mod thread. Commemorating the 100 Year Anniversary of the ending of The Great War. May there never again be such a great war. 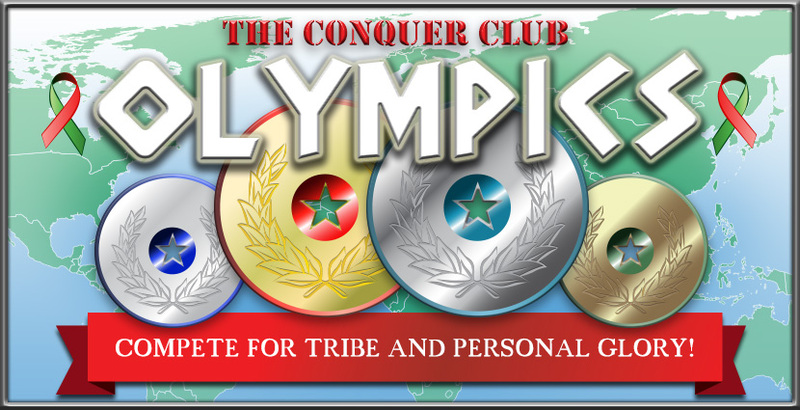 Compete for your tribe and for personal glory in the Conquer Club Olympics! And new in the 2018 CC Olympics - compete for your CC Class basd on the year of joining the club! Tribes compete for prize pool of 15,000 Credits! If you are not in a Tribe, you can join a default Tribe on your Tribes tab, or head to the Tribes Forum to join an Advanced Tribe. Tribes are scored on TOTAL points earned by all participating members. 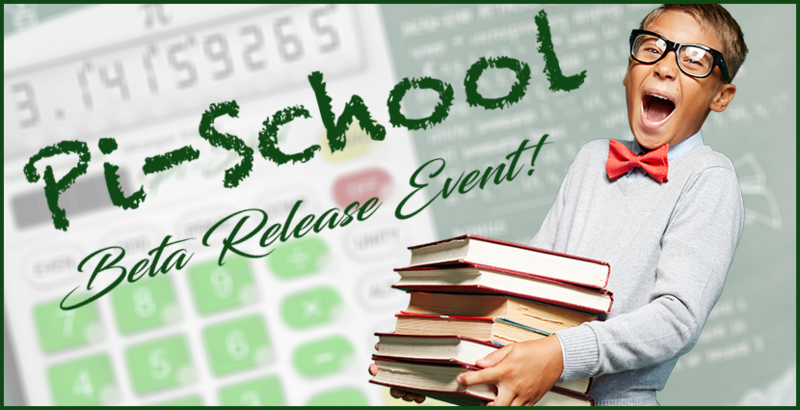 Classes will be scored based on AVERAGE points earned from all participating members. Charleston, South Carolina, 1843: The thunderstorm of Sunday night, the winding up of one of the most oppressive days ever inflicted on mortal man - was really terrific. The whole firmament growled thunder and shot lightning. It was blinding to look out, and at frequent interval the thunderbolts burst overhead with a power that shook the solidest structures - then rolled with angry growlings along the wings of the storm. St. Paul's Church was struck, but not seriously injured. Beyond this we have heard of no casualty, unless we may account as such the raining down of an alligator about two feet long, at the conrner of Wentworth and Anson streets. We have not been lucky enoug to find any one who saw him come down - but the important fact that he was there is incontestible - and as he couldn't have got there any other way, it was decided unanimously that he rained down. Besides, the beast had a look of wonder and bewilderment about him, that showed plainly enough he must have gone through a remarkable experience. By the last accounts he was doing as well as an alligator could be expected to do after sailing through the air in such bad weather. May 27, 1937 - In San Francisco, 200,000 people celebrated the grand opening of the Golden Gate Bridge by strolling across it. MEGAEGG is back, and the CC Bunny will be kicking off the Easter hijinks on March 28! This St. Patricks Day collect 44 4-Leaf Conquer Clovers and enter the Chase For The Green for a chance win big prizes, including a secret stash from the leprechauns' vault of stolen Green Conquer Stars! 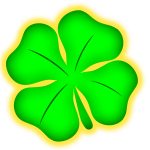 Clovers can be won by joining or winning any games, however your chances increase the more human players are playing, and of course on our St. Patrick's Day map. 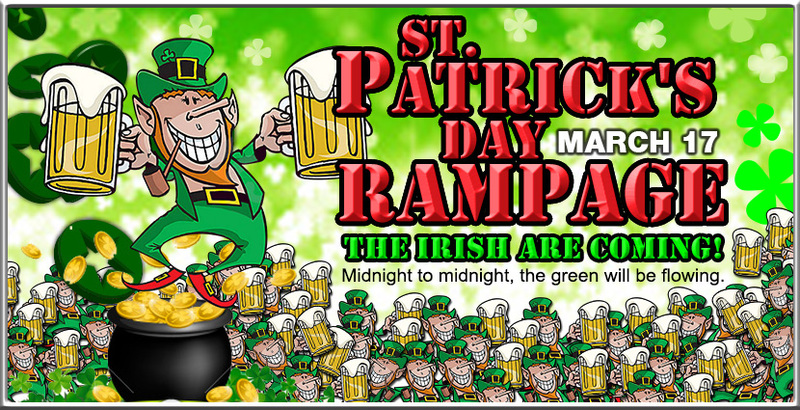 For an even wilder thrill, our St. Patrick's Scenarios will be released for the event. 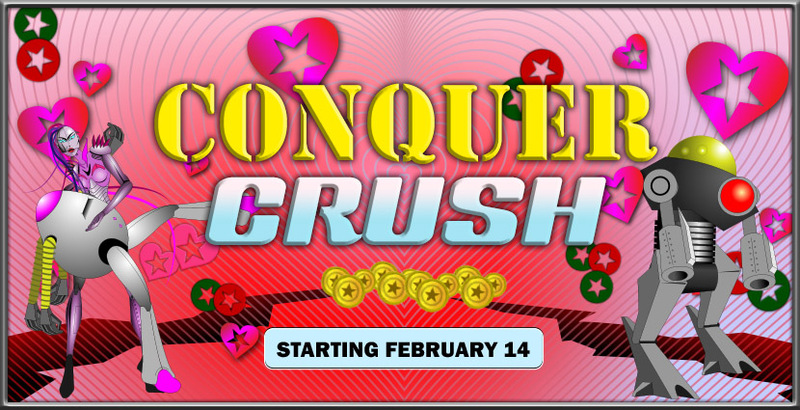 Hey lovers, it's Valentine's Day... time to satisfy our Conquer Crush. Plus many other special prizes for Houses and Lords showing the highest levels of strategy, honor and creative gusto! Civilization meets Conquer Club in an epic game of team play, strategy, diplomacy and galactic-scale shenanigans. In Homeworld, clans travel the expanse of space to explore, battle, solve mysteries, engage in diplomacy and learn about the universe around them! Play under pseudonyms in anonymous games against unknown competitors! 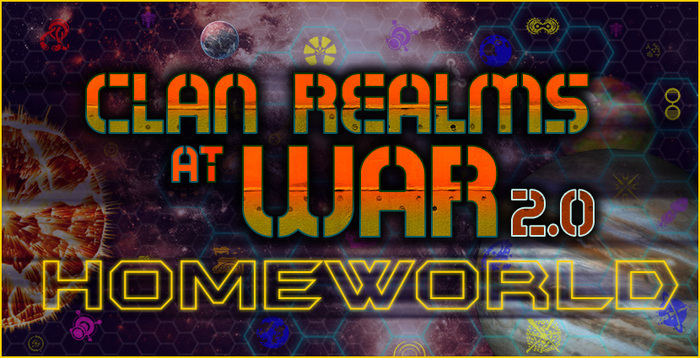 Battle, diplomacy, intrigue, secrecy and the unknown await you in... Clan Realms at War: Homeworld! The dawn of the space age has arrived. Worlds are overpopulated and resources are in short supply. Mankind faces its greatest challenge and Realms are forced to act. The battles will become greater than ever before. Now, the realms will be reborn. Go here for more details or to find out about getting involved. Participants can check out their Clan Realms tab in Central Command to follow the action or access Scoreboard. 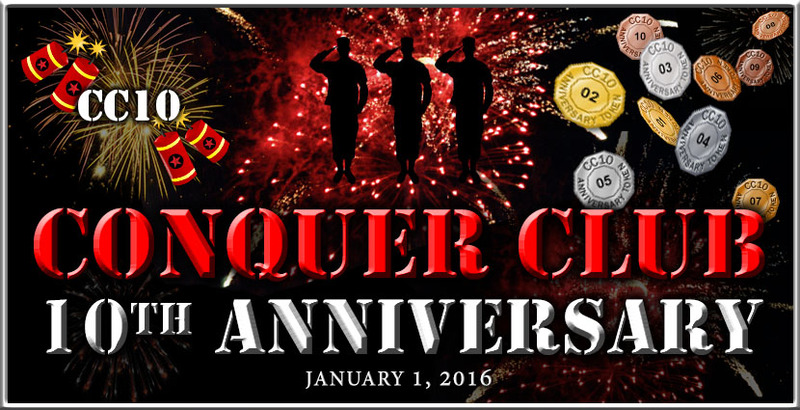 On January 1, Conquer Club turns 12. Collect CC12 cakes by joining and winning a rolling series of rumbling Battle Royales. From Dec 22 - Dec 28 start or win any game for a chance to score Stockings and Gifts. Chances of all item drops increase with number of players. Speed and assassin games have a lower chance of winning. Bot games have a grinch-like chance of winning. Your best chance, naturally, will come from the Christmas Map. To keep up with the steady flow of German themes, for December we are doing a Krampuslauf (Krampus run). 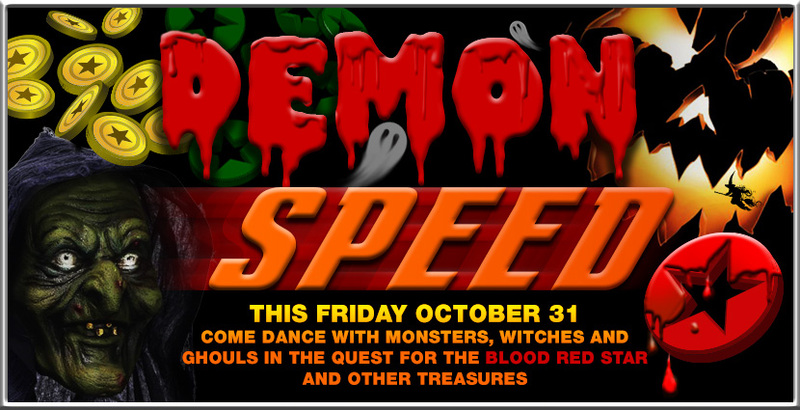 Speed games, including maps about racing, and maps with a horror theme. So it's really a Nightmare Before Christmas theme. Bavarian Crown Prince Louis, later King Louis I of Bavaria, marries Princess Therese von Sachsen-Hildburghausen. The Bavarian royalty invited the citizens of Munich to attend the festivities, held on the fields in front of the city gates. These famous public fields were named Theresienwiese—”Therese’s fields”—in honor of the crown princess; although locals have since abbreviated the name simply to the "Wies'n." Horse races in the presence of the royal family concluded the popular event, celebrated in varying forms all across Bavaria. The decision to repeat the festivities and the horse races in the subsequent year gave rise to the tradition of the annual Oktoberfest, which now begins in late September and lasts until the first Sunday in October. Alcohol consumption is an important part of the modern festival, and more than 1 million gallons of beer are consumed annually at Oktoberfest. Each week for 50 weeks, there will be a tournament representing one of the 50 states, followed by 3 bonus weeks representing D.C., Puerto Rico, and the U.S. Pacific possessions. Each of the 50 state tournaments will be identical in structure. Only the map will change. On July 3, 1886, mechanical engineer Karl Benz drove the first automobile in Mannheim, Germany, reaching a top speed of 16 km/h (10 mph). The automobile was powered by a 0.75-hp one-cylinder four-stroke gasoline engine. Benz’s engine was a refinement of the four-stroke engine designed by fellow German Nikolaus Otto, who had refined his design from Étienne Lenoir's two-stroke engine. The horseless carriage had a water-cooled internal combustible engine, three wheels, tubular framework, tiller steering, and a buggy-like seat for two. The vehicle further incorporated elements that would characterize the modern vehicle, including electrical ignition, differential, mechanical valves, carburetor, oil and grease cups for lubrication, and a braking system. As is often the case, Benz was not the only person working on such a design. However, Benz patented his work first. As such, he patented all the processes that made the internal combustion engine feasible for use in an automobile. In 1879 his first engine patent was granted to him. In 1886 Benz was granted a patent for his first automobile. Some battles are really close. Many are so close they are essentially inconclusive. Others are decisive victories, but the losing army manages to retreat in good order and pulls itself back together somewhere down the line. And then, there are those monstrous, crushing defeats from which there is no coming back -- defeats so totally cataclysmic, so utterly ruinous, that it seems as if Woden himself has strapped on a pair of steel-toed boots and is stomping on your nation's gonads. This month's challenge focuses on three of the most decisive beat-downs in military history, three knockout punches so brutal and hard that the loser never really got back up again. Troups Loyal to Charles V Sack Rome, Marking the End of the High Renaissance: On May 6, 1527 an army of Spanish Catholics and Lutherans beholden to Holy Roman Emperor Charles V, and led by Charles III, [Duke of Bourbon] marched into Rome. For eight days these unpaid troops looted and pillaged the city, inflicting especially harsh treatment on priests, monks and nuns, forcing the Pope to flee the Vatican, and destroying art and smashing statuary. During the occupation of the city more than 2000 bodies were disposed of in the Tiber River, and another 10,000 were buried in Rome and its environs. 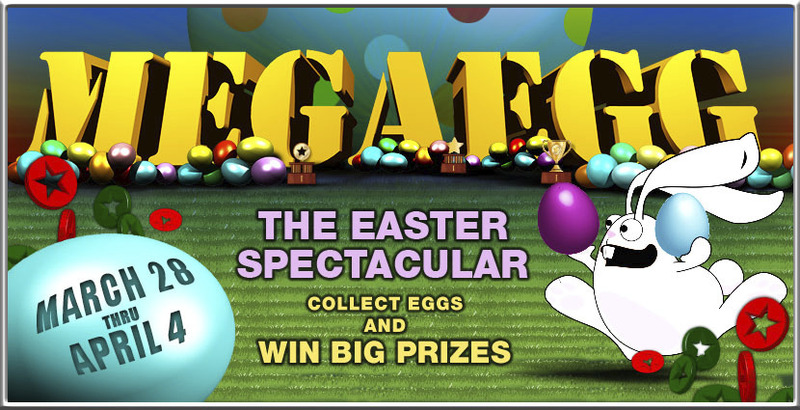 MEGAEGG is back, and the CC Bunny will be kicking off the Easter hijinks on April 16! April 2017 is Futiley Feudal! This St. Patricks Day (Friday, March 17) collect 44 4-Leaf Conquer Clovers and enter the Chase For The Green for a chance win big prizes, including a secret stash from the leprechauns' vault of stolen Green Conquer Stars! Propelled by the release of our newest map into beta, Ziggurat also rekindles the BetaMarch Challenge experience. Enjoy the new maps and participate in the map discussions for further development of our gameplay. Good Luck! On January 1, Conquer Club turns 11. Collect CC11 cakes by joining and winning a rolling series of rumbling Battle Royales. Everyone that gets 10 Cakes gets a and 20 Cakes gets a . With CC11, we are also announcing MapStarter 2017, an initiative to launch a new generation of CC Maps... and win some CC11 cakes. US Admiral, Richard Evelyn Byrd, with the assistance of his first pilot, Bernt Balchen, became the first person to fly over the South Pole on November 29, 1928. There is only one rule this month - don't be a jackass! September (from Latin septem, 'seven') was originally the seventh of ten months on the oldest known Roman calendar, with March (Latin Martius) the first month of the year until perhaps as late as 153 BC. After the calendar reform that added January and February to the beginning of the year, September became the ninth month, but retained its name. It had 29 days until the Julian reform, which added a day. September is the ninth month and the only month with the same number of letters in its name in English as the number of the month. The last day of September in any year always falls on a different day of the week from the last day of any other month. The autumnal equinox in the northern hemisphere and the vernal or spring equinox in the southern hemisphere occur on dates varying from 21 September to 24 September (in UTC). In 325 A.D Nicene council officially adopted the 'Julian Calendar' which declared that 'a year would be 365 days and 6 hours long' and March 25th being the 'New year'. Many centuries passed and at last astronomers found out the flaw in Julian calendar which exceeded the newly measured 'Solar year' by 11 minutes. This amounted over time from 325 A.D to 1582 A.D, exceeding nearly 10 days! Pope Gregory XIII ordered a change from Julian to the Gregorian Calendar in 1582, they had to cut down 11 days! Therefore, days were cut out between 2nd and 14th September 1752. 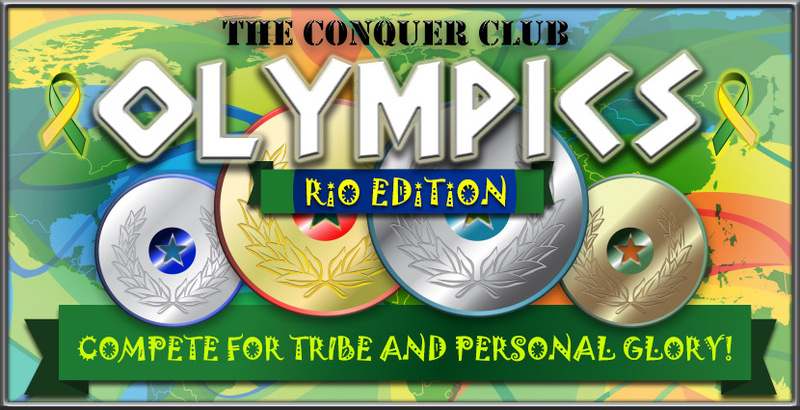 Compete for your tribe and for personal glory in the Conquer Club Rio Olympics! Tribes compete for prize pool of 15,000 Credits! If you are not in a Tribe or Clan, check out the Tribes Announcement. You can join a default Tribe on your Clan Warfare tab. Solar Impulse is a Swiss long-range experimental solar-powered aircraft project. The Solar Impulse project's goals were to make the first circumnavigation of the Earth by a piloted fixed-wing aircraft using only solar power and to bring attention to clean technologies. Canada Day is a momentous day in North American history. Under the Constitution Act (previously the British North America Act), the colonies of New Brunswick, Nova Scotia, and the United Providence of Canada collectively formed a single country called Canada. On this day, Canadians at home and all across the world celebrate the founding of their home. Independence Day for the United States of America was a triumph for not just a revolution in a war sense, but in a revolution for democracy. The American Revolution was a historical precedent many would follow - the underdog had finally won, the colony overthrew her queen, and the Age of Empires would soon see its close. On this day, not only do we celebrate for the end of a war, but for a new wave of freedom, liberty, and peace. June 5, 1783 - The first sustained flight occurred as a hot-air balloon was launched at Annonay, France, by brothers Joseph and Jacques Montgolfier. Their 33-foot-diameter globe aerostatique ascended about 6,000 feet. In September, they repeated the experiment for King Louis XVI, using a sheep, rooster and duck as the balloon's passengers. SpaceX was founded in June 2002 by Elon Musk; his vision was to build a simple and relatively inexpensive reusable rocket that would go into space multiple times; similar to the turn around time capabilities that commercial airliners currently exhibit. On April 8, 2016, Falcon 9 launched Dragon on a cargo resupply mission to the International Space Station for NASA and, for the first time, landed the first-stage of the Falcon 9 back on a droneship in the Atlantic Ocean. And so we shall see if balloons can once again break barriers. Beginning more than two centuries ago, humans used hot air balloons to throw off their Earth-bound shackles for the first time. Today, Bigelow is betting that it is once again balloon-like technology will enable us to defy Earth's gravity - this time escaping it entirely into deep space. Charles Richter was born on April 26, 1900 in Overpeck, Ohio. He is most well know for collaborating with Beno Gutenberg to develop The Richter Magnitude Scale, published in 1935. The previous system, developed in 1902, was based on subjective measurements of how buildings and people were affected by an earthquake. The Richter Scale introduced a more absolute measure of intensity by implementing the use of a seismograph which is able to record the Earth's motion. The Richter Scale rates the magnitude of an earthquake (or the amount of energy it releases) as measured by the seismograph. Since the basis of the Richter Scale is a logarithmic, each level on the scale is ten times stronger than the previous level (each whole number being representative of a level). The Richter Scale has since been succeeded by the Moment Magnitude Scale which uses different formulae but remains similar to its predecessor. This St. Patricks Day (Tuesday, March 17) collect 44 4-Leaf Conquer Clovers and enter the Chase For The Green for a chance win big prizes, including a secret stash from the leprechauns' vault of stolen Green Conquer Stars! As takman2k sat around his apartment one evening running diagnostics on his computer, he watched as his cat, having slept through the day, finally arose to discover an empty box which previously contained food. Eventually it dawned on him that his cat intended to engage him in a prolonged effort to deprive him of sleep. While this reality set in, takman2k began to fondly anticipate the new season of Top Gear. After a quick search, he pulls up the newest article concerning the show. The headline, 'new Top Gear hosts take over Liverpool' sticks in his mind while he's wondering if he'll ever solve his computer issues. For a few minutes he manages to drift off into a daze imagining the endless possibilities of winding high end cars through the beauty of the United Kingdom and he wonders, is there a way to bring this to my life? 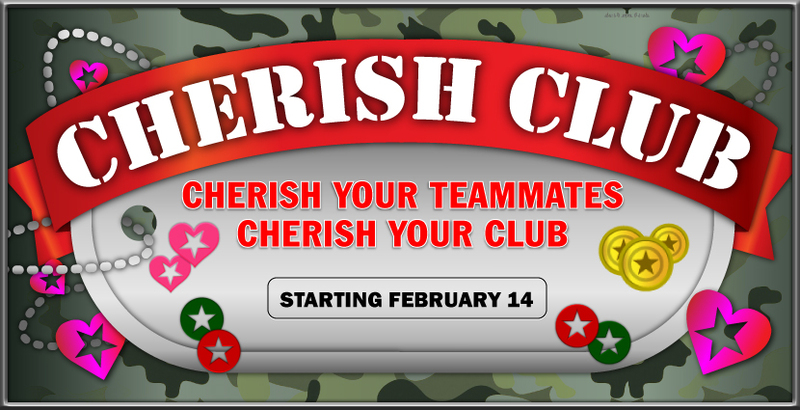 Cherish your way to the Tournament of Cuddles and compete for big prizes including Credits, Trophies and a Red Star! We have pulled an existing scenario from the brilliant mind of DoomYoshi to use as a teaser. Use this month as a break from the whirl wind of CC10 games and prepare for the upcoming challenges in store this year. 25 points are required for a medal. Each win is worth one point. So it's simple, win 25 games for a challenge medal! The Super Royales - a series of casual BRs requiring special CC10 tokens to enter. Winners score a CC10 Cake. Christmas Event Games played in the Christmas Event, particularly on the Christmas map, will have a chance of dropping CC10 tokens. Your ultimate goal is to get into the CC10 Finale. 10 Players honor 10 years of CC by battling it for prizes of a $10x10 Amazon Gift Card, Red Star and more. Check out all the details here. In honor of CC10 the January Challenge will highlight major additions to the site over the past decade. Through these ten auto-tournaments we will feature new settings and maps which were released during each year. As with CC10, one new tournament will be released each day. In order to enter a tournament a corresponding CC10 token is required. We intend to run each auto-tournament once, so plan accordingly! 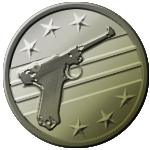 All tournaments have prizes for the top players in the form of gold, silver, and bronze challenge tokens in addition to participation ribbons for entering. These challenge tokens and ribbons are what will count towards your score for the January Challenge and are reflected on the Decade in Review Scoreboard. Additional prizes will be awarded in the spirit of CC10! Any game that starts as part of the Decade in Review Event will also have a chance of dropping CC10 Tokens. 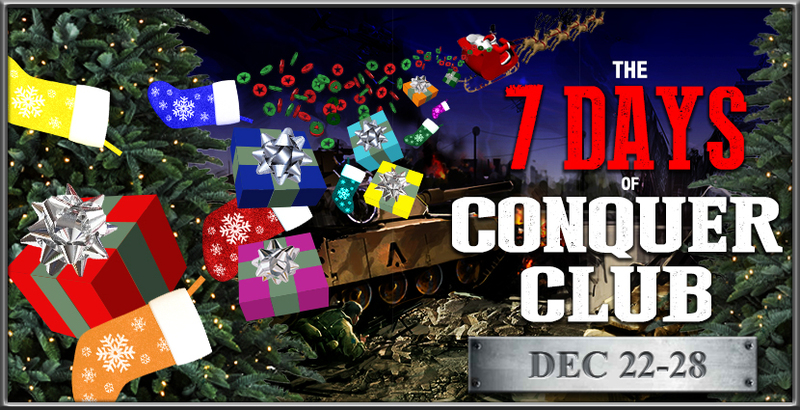 On the 7 days of Christmas, your Conquer Club brings to you... The 7 Days of Conquer Club! From Dec 22 - Dec 28 start or win any game for a chance to score Stockings and Gifts. Chances of all item drops increase with number of players. Speed and assassin games have a lower chance of winning. Bot games have a very low chance of winning. Your best chance, naturally, will come from the Christmas Map. Bonus: Playing on the Christmas map can also win CC10 Tokens for the upcoming CC10 Mega-Event! Merry Christmas, Happy Conquering and raucous seasonal cheer to all! December Challenge: The Crossword Puzzle. The history of the crossword puzzle is debated. Several puzzles of similar structure were developed and published around the world. Arthur Wynne, a journalist from Liverpool, England, is considered the inventor of what we today call the crossword puzzle. His first puzzle was published on 21 December 1913 in the New York World. The puzzle became a weekly addition to the paper and soon the game spread to other newspapers. The 'fad' grew during the 1920's with varying opinions on whether or not the puzzle was beneficial or even harmful to society. The young child begins to play with crayons. Doodle Earth: 6 players, any settings. Bronze. The developing child experiments with craft materials. Patch Wars: 7 players, any settings. Silver. The adolescent hits the streets with spray paints. Philadelphia: 8 players, any settings. Gold. Collect at least 1 of each medal to fulfill the Challenge. Only victories count. 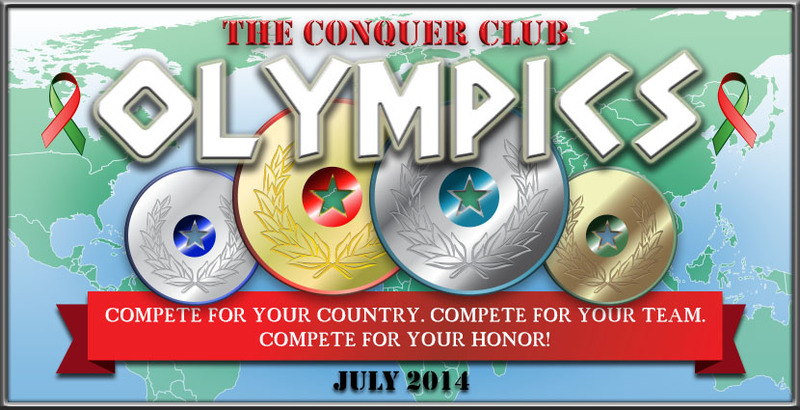 Compete for your tribe and for personal glory in the Conquer Club Olympics 2015! For more information go to the Olympics Announcement. Due to this change, Britain theoretically lost 11 days- creating financial problems and contract issues nationwide. Because of the insane proportions of this event, the challenge will also be a little insane! 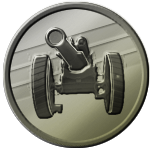 We will not divulge the exact settings, however, it will be VERY easy to get this medal should you figure out the setup. Augustus Caesar, born September 23rd, 63 BC, was the founder of the Roman Empire and its first emperor (following the death of Julius Caesar). Born Gaius Octavius, he acquired power after he was named in Caesar's will as an adopted son and sole heir. After forming the Second Triumvirate with Mark Antony and Marcus Lepidus, he was able to overcome his great-uncle's assassins. From there, the rulers divided Rome into three sections and ruled as military dictators. The Triumvirate was eventually torn apart due to overambitious leaders- Lepidus was sent into exile and stripped of his position, and Antony would commit suicide following his defeat in the Battle of Actium. After the fall of the Second Triumvirate, Augustus would make a series of improvements to the political structure of Rome, under the premise of a Republic, in order to ensure his autocratic rule as a military dictator. Under Augustus' rule Rome would enter the Pax Romana, although they had minor internal conflict they were free from the large-scale affairs in the world around them. Augustus would die on August 19th, 14 AD. Here at CC, to celebrate his life and my pun-making skills, we will use several Rome maps in this challenge: Imperial Rome, Poison Rome, Battle of Actium, Imperium Romanum and Colosseum. To represent the strife preceding Augustus' rise to power, we will be using Assassin and Terminator settings. July Challenge: Is There Life On Pluto? Pluto is the tenth most massive body directly orbiting the Sun, and the second most massive known dwarf planet. It is made primarily of rock and ice, and occasionally crosses paths with Neptune on its orbit around the sun. These two bodies will be kept from colliding due to an orbital resonance. Pluto was discovered in 1930, and originally considered the ninth planet from the Sun. Due to the discovery of new icy planetlike formations around Pluto, including the scattered disc object Eris, the International Astronomical Union redefined what constitutes a planet- excluding Pluto from that classification. On July 14, a spacecraft called New Horizon will fly past Pluto in our first attempt to map it. The spacecraft will send back images of an alien landscape with stark features, including mountains, craters, and other landforms that were previously unknown. 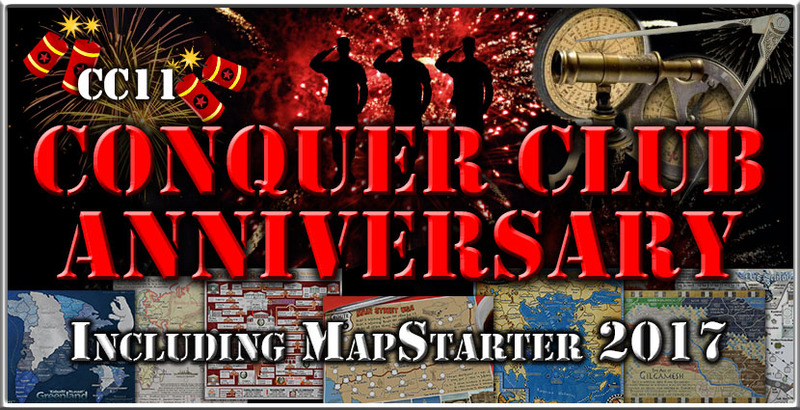 To support this event, members of Conquer Club will celebrate with three space themed maps: Space, Solar System, and All Your Bases Belong To Us (in hopes of finding Aliens on Pluto, of course!). The 19th century was a fairly calm one, in terms of European wars. After Napoleon was defeated at Waterloo, there were no major European wars until the Crimean war. In 2015, we can still appreciate this point, as there have been no major wars in Europe since World War II. The most likely war looks to be an invasion of the Ukraine. It seems we have come full circle. This was also an important period for the formation of the Benelux region, as sovereign and separate states, after centuries of Austrian and French rule. Then there is the battle itself. Any military historian knows at least in passing the general idea of the battle. There are songs and images which have memorialized this battle. The artillery, cavalry, skirmishers, flanking, hiding behind ridges and in Hougoumont, there really was a tremendous battle. Draw your forces, and get gold with clan-rules on Waterloo. Whichever part of the world you belong to, there was a sense of joy when leaders of all nations declared that the Nazi's were defeated and laid down their weapons. Seventy years later, with many still living, Dignitaries, Government Leaders, Soldiers, and Monarchs will gather over a 3 day weekend to mourn the passing of many men who dedicated their lives to freedom from Nazi tyranny, and to celebrate the 70th Anniversary of VE Day. 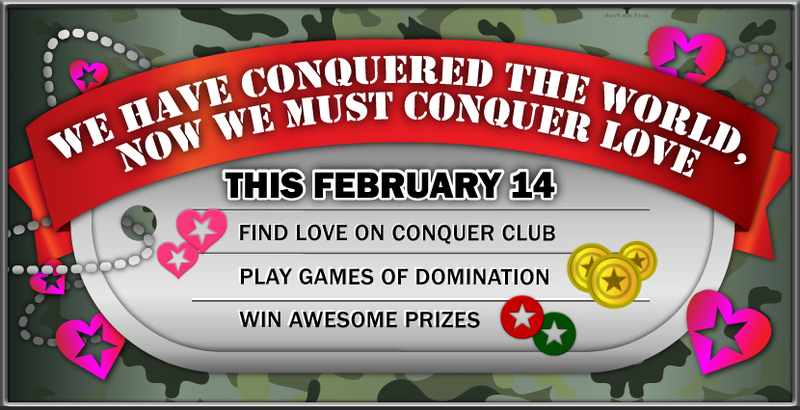 Those who are on Conquer Club, will be able to celebrate in their own way with this contest. The Easter Bunny is back, and it's as mad and egg-laden as ever! Your Easter Goal is be to score 100 Bunny Points. Each Egg is worth 1 Bunny Point, however you will need 20 Eggs of each type to score any points and get into MEGAEGG FINALE, a tournament with a host of great prizes. See info for more details on scoring eggs! The Battle of Actium was one of the last battles in the 'Final War of the Roman Republic'. This was a battle which was started by TMZ. Actually, they weren't around yet, but they might as well have been. Marc Antony controlled East Roman Empire and Octavian the West. Octavian's sister was married to Antony, who was sleeping with Cleopatra, and donated most of his Eastern Empire to her and the Egyptians and then married her, even though he wasn't divorced yet. Octavian mobilized his troops and they met at the Battle of Actium. 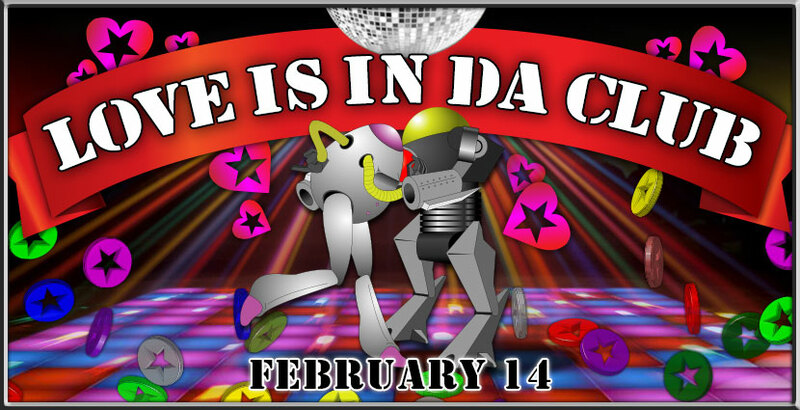 On Feb 14, Love hits the Club, and some players (or bots) may get smitten. This time the love will be spread over 3 days, culminating on Mon Feb 16 (3PM-4PM CCT) in Hands Across Conquer Club, a special event where all Club members will come together at one time to share their love for each other and CC under a rainbow of inventory love. 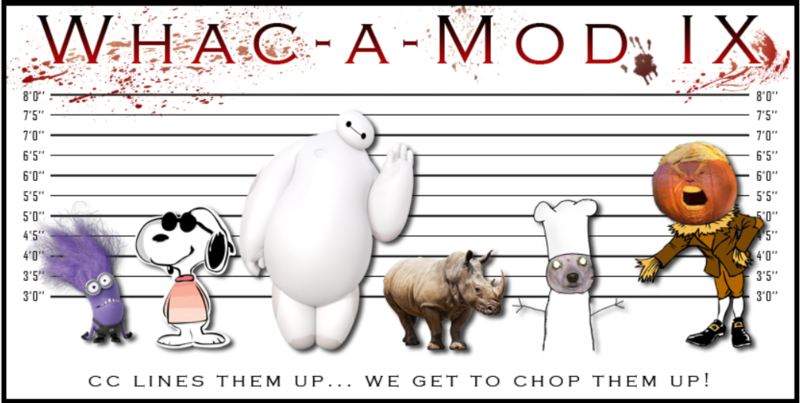 You will compete to enter the Tournament of Cuddles and compete for big prizes including Credits, Trophies and a Red Star! You need at least 35 Points for the Challenge - See Info for scoring details! It was only a matter of time before I integrated my two current-favorite aspects of Conquer Club. Not all the challenges going forward will be scenario-based, but for those high rankers who don't want to lose points, but still want to compete for the prizes, we now have something for you! The first scenario I crafted uses some of the more popular scenario ideas going right now, with a twist, to add challenge. There are 3 teams, not with equal chances to win. The catch is that you can't pick your partner! You also can't pick your color. As another drab year dawns, we are ready for some old-fashioned Monthly Challenge action. On January 8, there are Sri Lankan elections. From an election standpoint, these have it all - violence in the streets, boycotting, illegal tactics etc. From a Conquer Club standpoint, Sri Lanka is an important territory, since I once missed it in an escalating sweep on World 2.1. Upon further research, there was at least one other player who has missed it! That makes it 'the invisible territory'. 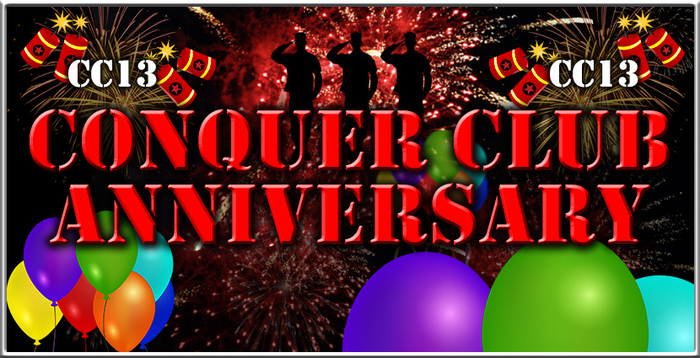 On January 1, Conquer Club turns 9. 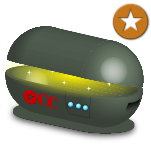 Collect CC9 cakes by joining and winning a rolling series of rumbling Battle Royales. Collect 35 cakes to join the Monster Royale - the first ever Battle Royale tournament! Start each type of game on the right day on the Christmas map and have a chance at a Stocking. Win games you start on the right day to have a chance at a Gift. Chances of all item drops increase with number of players. Speed and assassin games have a lower chance of winning. Games must be completed by Jan 31 to count! Merry Christmas and a jolly fine season of mirth to all! This December's challenge is a look back at what was new in 2014. We had the monthly challenges boom (and bust); many large-scale site-wide events; still new game features and UI. We're giving everyone on CC a (virtual) passport, and we challenge each of you to get as many stamps as you possibly can. How do you get stamps, you ask? By doing a variety of things but mostly winning games. Check the Details link for all the info! The end of November is the end of the Atlantic Hurricane Season. If you live near an ocean, you have probably been affected by a Hurricane, a Cyclone or a Typhoon. Now is you chance to fight back! To counter the speed of the wind, we must play the Speediest of Games - 1 Minute Rounds. 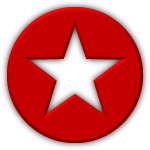 Claim the Blood Red Star and the Demon Speed bragging rights. Pumpkin = 1 Point, Cat = 2 Points, Spider = 3 Points, Bat = 4 Points, Witch = 5 Points. The 8th of October gives a nice treat with a lunar eclipse for the hemisphere centered on the Pacific Ocean. Our challenge, however, focuses on the solar eclipse of October 23rd. Since the majority of the eclipse can be seen from the Arctic, and less of the eclipse is visible from Greenland, full points will be given to Arctic games, while only partial points will be given to Greenland games. Over 4 years, this event recreates the entire history of World War I. 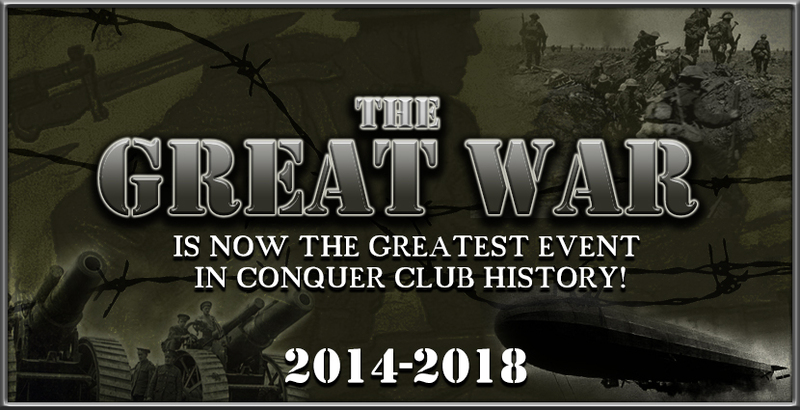 For more details, see The Great War. Unfortunately, construction of the Peter Strasser stopped in September 1939, due to the Germans allocating resources to some minor conflict in Poland. Yes, that's right... this marks the 75th anniversary of WWII. More importantly, it marks 75 years of not-a-ship. 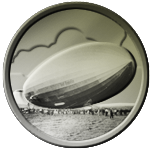 The Graf Zeppelin was also never complete, and was used as a storage dump for stolen furniture, as well as a barge after it was captured by the Russians. Since there were 12 signatories, there are 12 players. The map is from the era shortly after Geneva Convention went into practice. (Unification Germany would have been better but it's too small for 12 players). The Zombie spoils will represent POW camps. Reinforcements are unlimited, which won't matter early on, but will ensure a great late game. Note the new scoring system! Due to the longer nature of the games, we have opened the completion window for an extra month. Compete for your country. Compete for your team. Compete for your honor! Country Scores are scaled by a factor derived from the number of active players registered to that country. By the time you read this, the Group stage of the World Cup will be over and we will be entering the tournament bracket. Hopefully, your favorite teams will have advanced. Hopefully, match fixing will be at an all-time low. Hopefully, you will enjoy this challenge. To go from a black man in prison, to an internationally respected leader, one needs fundamental teamwork skills. As such, all the games are team games. As is the case of organized resistance, those in power will seek to deny your right to communicate effectively. With No Spoils and No Forts, your armies will be isolated. Can you work together to achieve the greater good? Take on Team CC by joining Games from the Event banner from May 26 to Jun 1. 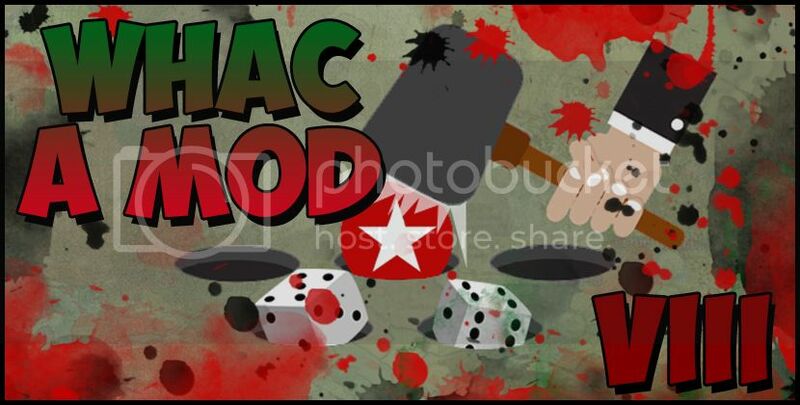 Top 32 Players and Top 16 Mods gain entry to the Whac-A-Mod Showdown, the final all-in tournament to the death between these two mighty armies to decide who rules CC! The Quebec Act of May 20, 1774 was an attempt by England to halt the expansion of the 13 colonies westward by awarding those territories to Quebec. You will need strategy and diplomacy to get through the main repercussions of this Act - the American Revolutionary War. The Easter Bunny is hip-hopping its way towards Conquer Club with an unparalleled monster truck full of eggs. There will be Tank Eggs, Bomb Eggs, Gift Eggs, Greek Eggs & Space Eggs. You will find eggs on the home page, eggs in games, eggs in tournaments, eggs on the forum, hidden eggs, secret eggs, magic eggs, mystical eggs, eggs in your head, and eggs inside eggs. Your Easter Goal will be to score 200 Bunny Points. Each Egg is worth 1 Bunny Point, however you will need 40 Eggs of each type to score any points and get into MEGAEGG FINALE - A Red Star Spectacular, a tournament with a host of great prizes. Point System: Bronze, Silver and Gold Tokens yield 1, 4 & 8 points. 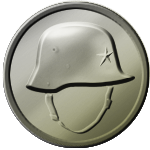 Bronze Tokens are awarded for joining a qualifying game, Silver Tokens for winning a qualifying game on the Australia map, Gold Tokens for winning a qualifying game on the Antarctica map. No points are scored until 1 Token of each type has been collected! To meet the challenge you need to get 40 Points. 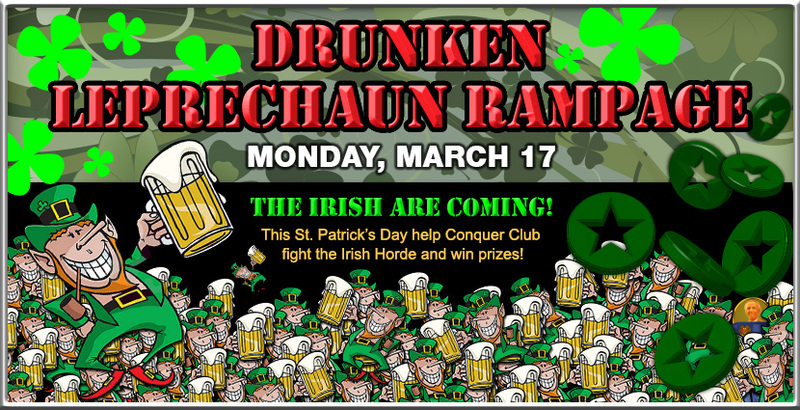 Batten down the hatches Club members, hordes of inebriated leprechauns have been spied stumbling around on the horizon! These maniacal hooligans will trample everything in their wake and bore us to death with tales about red shoes and orange beards, but they do have one weakness: The 4-Leaf Conquer Clover. This St. Patricks Day (Monday, March 17) collect 44 4-Leaf Conquer Clovers and enter the Madcap Chase For The Green for a chance win big prizes, including a secret stash from the leprechauns' vault of stolen Green Conquer Stars! 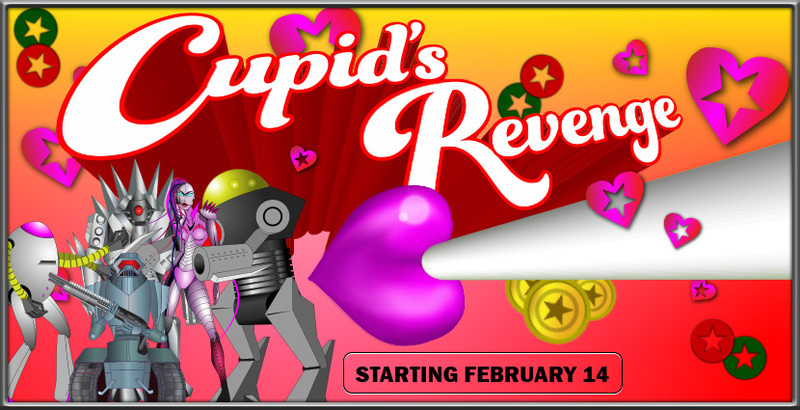 You have conquered opponents on the battlefield, you have conquered players on the scoreboard... this February 14th you will try to conquer the most dastardly of foes imaginable... LOVE! Enter the Tournament of Cuddles for big prizes including Credits, Trophies, Conquer Cup entry... and the first Red Star ever to be issued!